Avoid the frustration and wasted time caused by most tunnel controllers with Micrologic’s advanced solution. The LogicWash® Tunnel Controller allows users to keep tighter controls while seamlessly integrating with your legacy system. The modular design also allows for easy wiring for simple and cost-effective future expansion. Micrologic’s LogicWash Tunnel Controller solution features an embedded Smart controller that offers industrial-grade temperature ranges. It also has nine function types, including: On Demand, Always, Front/Back/Both Tires, Front/Back Bumper, Windshield, Momentary, Toggle ON/OFF, Time Delay and Time of Day. Because the controller can be up to 300 feet from the relay stations, the LogicWash Tunnel Controller is the smart addition to businesses of almost any size and layout. Our controller is also configured in inches, not pulses, making it easier and faster for the user to configure. Up to 256 Output Functions: Users can add functions in sets of 8, allowing for easy expansion to your equipment controls as your business grows. 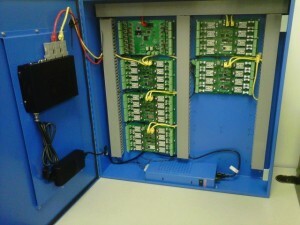 Up to 256 Inputs: Inputs can be be added in sets of 16 and programmed to detect virtually car wash condition or event. Functionality can also be configured to have alerts sent via SMS or email when certain inputs are detected by the controller. Double Pole, Double Throw Relays: Our advance relay board design allows you to connect multiple devices (light and function) to the same relay increasing efficiency and reducing cost of your system. Look Back Feature: Save on energy costs by keeping selected functions in idle or low speed until engaged by the vehicle. Anti-Collision Feature: Mitigate risk with just one input and a virtual function! When the Controller senses a collision is imminent it will stall or stop the conveyor automatically. Separate inputs can be added to detect if the entrance or exit of the tunnel is in the correct positions, and take the necessary measures. Simulated Pulse Feature: The LogicWash Controller has a built in Simulating Pulse feature allowing your car wash to operate in the event of Pulse Switch failure. Tire Position Feature: Automatically activate and deactivate tire equipment based on sensing position. Simulated Entry Sensor Feature: In the event of a photo eye/loop failure, this feature helps maintain productivity. Roller Position Feature: Improves the efficiency of rollers by automatically detecting the position of the rollers. System can be configured to send multiple rollers, up/down/up combinations or front and rear tire. Dual Input Voltage: The Micrologic Controller can accept both AC and/or DC voltages for inputs. Remote Configuration: Browser-based configuration makes configuring the LogicWash Controller a snap. Forget specialized software on a separate PC. Programming can be performed locally or from anywhere in the world with any Internet enabled device. Easy Integration: Our solution can be integrated with Point-of-Sale Terminals, Entry Payment Terminals or Motor Control Center.